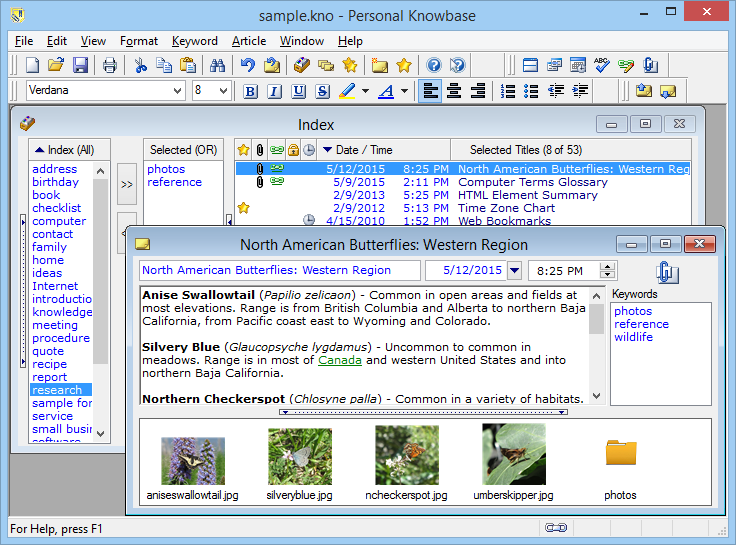 This example shows Personal Knowbase's Index Window in the back, behind an Article Window in the foreground. Double-clicking on the article's title in the Index Window has opened the Article Window for full viewing and editing. The paper clip icon indicates that this article has at least one attachment to a file or Internet address. The green, underlined text in the article content is a hypertext link to another article, a file, or a web site. The optional pane along the bottom shows thumbnails for image file attachments and icons for other attachments.